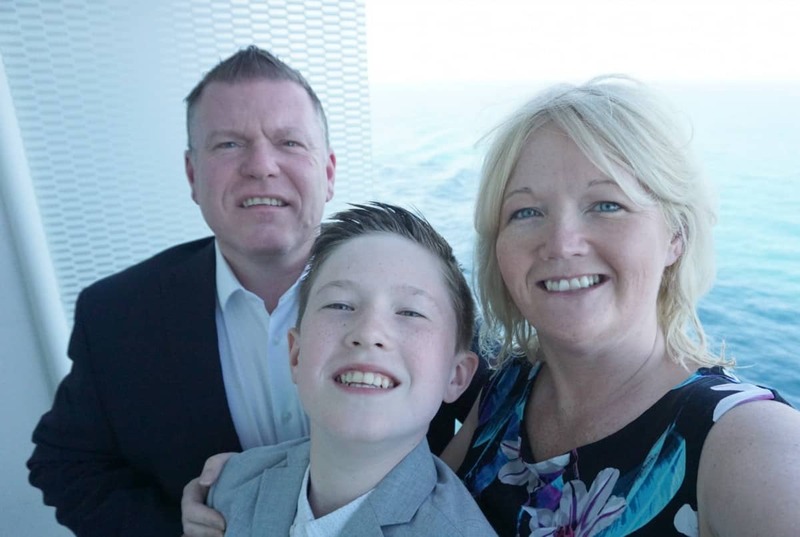 You have booked your first family cruise, spent hours deciding which is the best family cruise cabin, researched cruise ports and drinks packages to the point you feel almost prepared. But then comes the question, what to wear on cruise formal night? To find out what to wear on cruise formal night look no further we have done the research for you. What to wear on cruise formal night? Formal night guidelines and tips for families with kids and teens. How many formal nights are there on a cruise? How dressed up can you get on a cruise formal night? What do children wear on formal night? Do men have to wear dinner suits? How about formal night dresses or mens dress shirts that get creased? Can men hire tux’s on a cruise ship for the black tie event? What if I don’t want to do formal night? What are your top tips for formal night accessories? So what do I wear on a cruise formal night? Personally formal nights are my favourite nights of the whole cruise. Some cruisers love it and fully embrace it, others avoid it like the plague. For us as a family the more black tie nights there are on a sailing the better. 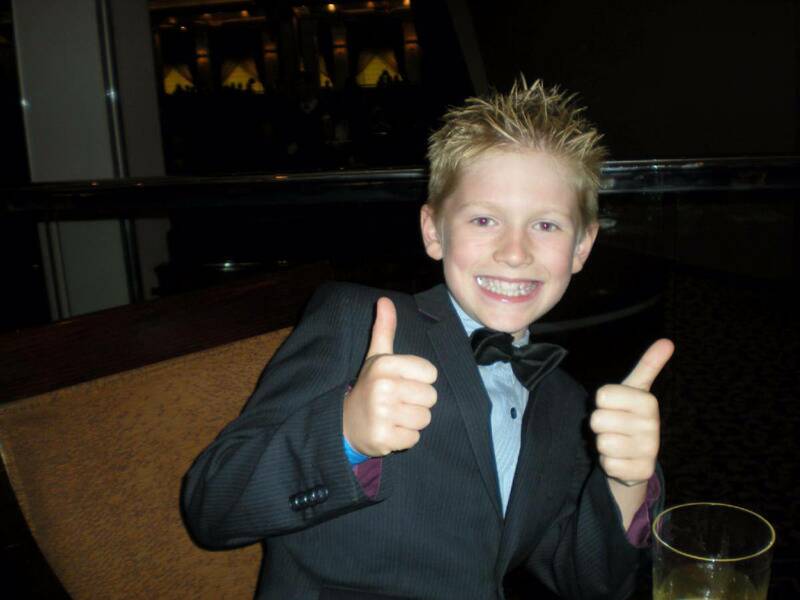 Also as we have fully embraced cruise formal nights the kids love it too. If I am truly honest once a cruise is booked, I spend all year thinking about cocktail dresses. As family cruisers we are not just thinking of ourselves we have babies, kids and teens to organise too. Making organisation and thinking ahead essential. 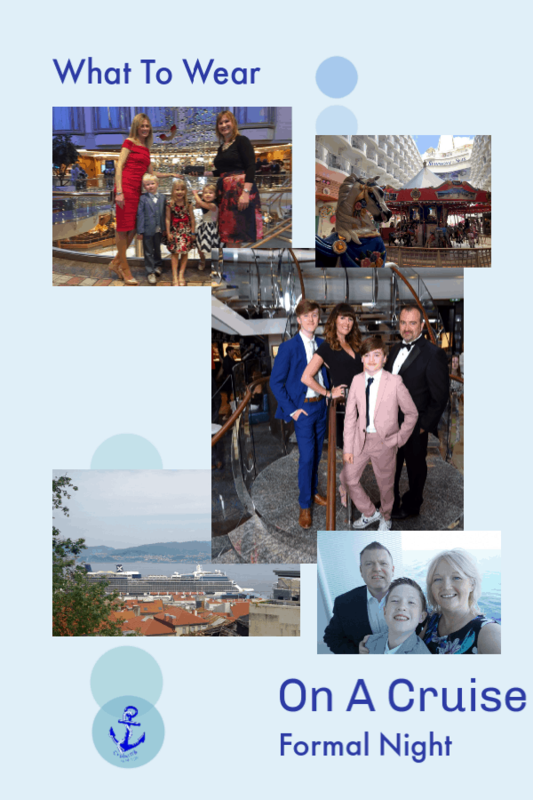 I thought I would start by addressing some of the questions we have been asked, and further down looking at some of the guidelines for different cruise lines. There is always a minimum of 1 night on a cruise however some have up to 3 or 4 on a one weeks cruise, it varies massively depending on the cruise line. For example Royal Caribbean normally have 1 on 5 nights and under, 2 on 7 nights up and 3 on 10-14 day cruises. Regardless of the recommendations you can dress up as much as you want, I find there is aways a great mix of formal night dresses and a really supportive atmosphere. I have worn very dressy dresses and dressed smart elegant and never felt out-of-place with either. It’s all about what makes you feel great. Really, do not over think it you could wear a trouser suit, a very plain basic dress with heels or just what makes you feel nice on your regular night out. 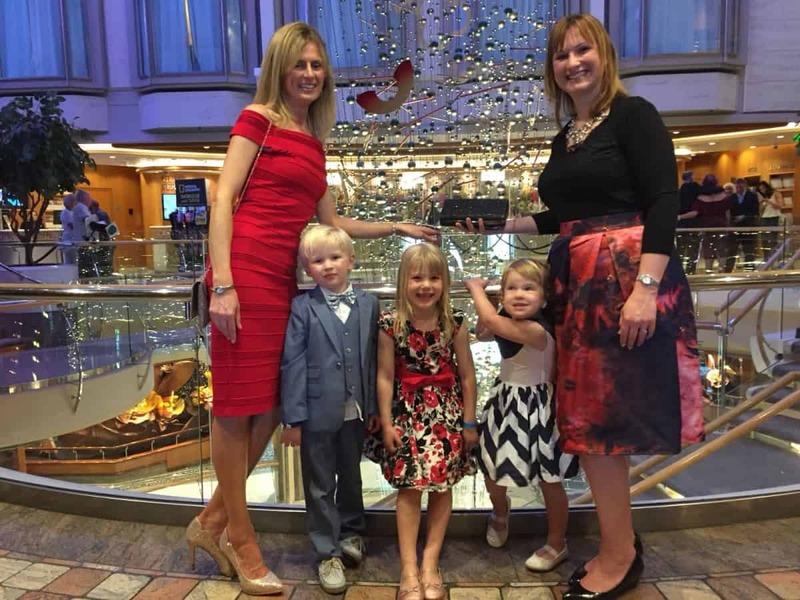 What to wear on cruise formal night for children? Is one of the most frequent questions we get asked. 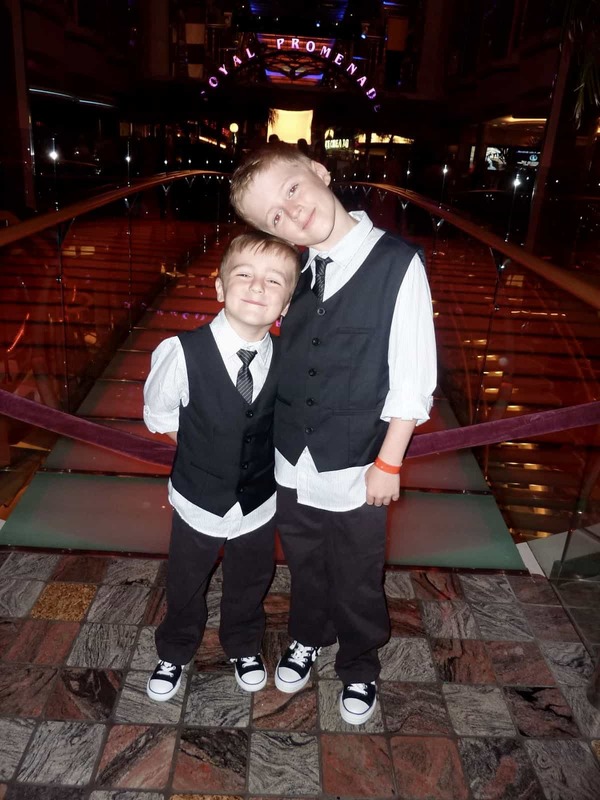 Cruise lines attitudes to kids formal night wear is generally pretty relaxed as long as children look smart and aren’t wearing denim or trainers. Our boys have always loved dressing up for formal night, we usually buy a suit or trousers and waistcoat from Next or Debenhams, and once they grow out of it I sell it on eBay, they always sell. Don’t worry about buying smart shoes that will be worn once try some smart pumps for footwear such as Converse these look cool and trendy with a waist coat and tie. Clarkes or Next have a good selection for toddlers. I find it makes the outfit look cool and more in keeping with their personalities. Most cruise lines are pretty flexible and happy for men to wear a dark suit or tuxedo, as long as it’s with a tie. Again its about what you feel comfortable in. But don’t men look great in a tux? Sorry guys! Formal night is such a great time to embrace this, my hubby says he takes his tux under duress, but what a great opportunity to get a family photo. I never iron dress shirt, if I do it’s only 1 because my itinerary is telling me there is a formal night on night 2 of our cruise. And I send the rest off to get ironed by the ship ironing service. Dresses can be hung in the bathroom with the shower on hot. The steam drops the creases in no time. Yes, most cruise lines offer a hire service for formal suits. You can also just hire shirts, my husband normally takes his dress shirt for his suits but hires another for the second formal night. If you don’t want to get involve in formal night that is totally fine. Cruising is about doing what you love and feeling relaxed. Most cruise ships have restaurants and or the buffet restaurant running an a non formal basic during formal night. Try to find a pair of shoes and bag that will go with all of your formal outfits to save on packing, gold, silver of rose gold are always great options. Pack a pashmina ( the best way to pack is to roll it) it can be chilly on deck at night and you can’t go on a cruise and not take a walk on the promenade at sunset. Or go for light-weight bags and sandals and take a few! 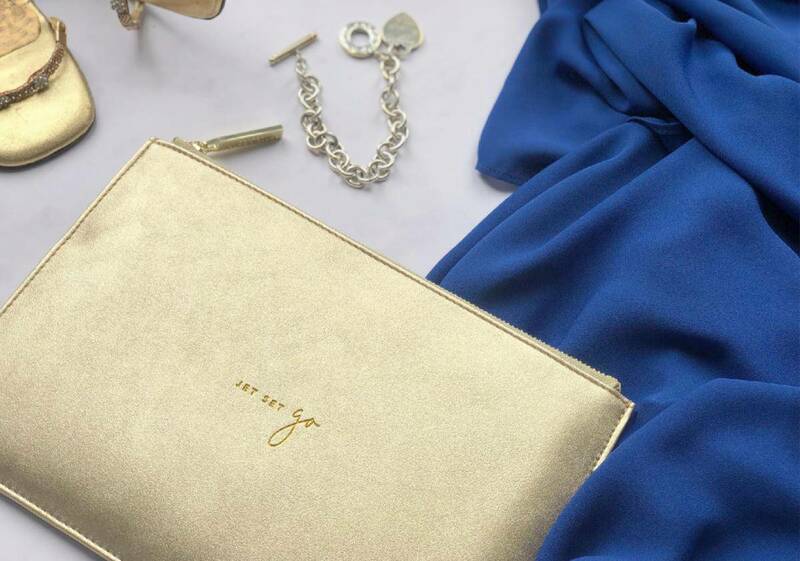 I adore these Katie Loxton Clutches from Lily And Stella. They come in a variety of colours and have cool messages on the front. Don’t forget to pack cufflinks, and a bow tie. I have lost count of how many bow ties we have bought on cruise ships. But don’t worry as you can hire these too! Ensure their evening shoes are kept separate, cruise port floors and busy port towns can be dusty and you do a lot of walking in port. Best pumps are better saved for the evenings. And comfy trainers are most certainly better for all that walking during the day. And a fantastic tip from one of our readers, if you kids are magnets to mess like one of ours, change them after dinner before the kids club to keep their formal night outfit fresher for longer. Why have I never thought of that before? 4-6 night cruises have 1 formal evening, 7-13 night cruises have 1, 14- to 20-night cruises have 3 formal evenings, 21- to 28-night cruises have 4 and cruises of 29 nights or more have a minimum of five formal nights. Formal dress is tuxedos, dinner jackets or dark suits for men. Evening gowns, cocktail dresses or elegant pantsuits for women. And smart dresses shorts and shirts, or suits for boys and young teens. Should you want to miss out of formal night you can head to the buffet restaurant for a more relaxed affair. For 3- 5 night cruises 1 formal night, 6 and 7 nights cruises 2 formal nights, more than 7-14, 3 formal nights. 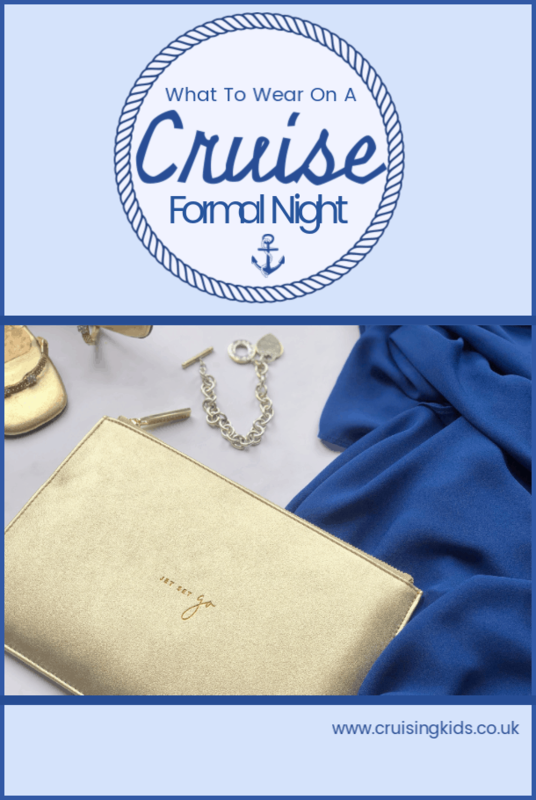 Although Royal Caribbean embrace formal night it is optional, formal attire for men is suits and ties or tuxedos. For women cocktail dresses. Children are welcomed with smart dresses shorts and collared shirts, however older teens tend to wear trousers and shirts with waistcoats or jackets. The Windjammer Cafe is available for those wanting a more casual affair. Some ships also hold a 70s themed night should you want to dress with a retro vibe. Cruises of 4 to 6 nights have 1 Chic Night, Cruises 7- to 11-night have 2, and those of 12 nights or more nights have 3 Chic Nights. What are Chic Nights on Celebrity Cruises? Chic nights are Celebrities relaxed brand of formal evening, it is totally your choice you Chic you choose to go. Men can wear suits, trousers or smart with collared shirts or tuxes. Some woman choose spectacular chic night dresses, where others choose simple elegance it really is up to you. Boys are required to wear full length trousers in the main and some speciality restaurants on chic night, however smart pumps ( Strictly not trainers) are acceptable with a collared shirt or smart collared polo. If you wish to stay casual you can still dine in the International Marketplace, outdoor grill or AquaSpa Cafe. P&O formal evening are called Black Tie nights, there is generally 1 Black Tie night during a 2-4 night cruise, 2 Black Tie nights during a 5-7 night cruise, 3 Black Tie nights during an 8-10 night cruise and 4 during an 11-14 night cruise. Ladies wear glamorous evening wear including cocktail dresses, ball gowns or even smart trouser suits. For men, dinner jackets or tuxedos are the norm, but a dark lounge or business suit and tie can be worn as an alternative. You can also wear formal national dress and military uniform. The Dress Code for children in the evening is Evening Casual, regardless of the adult Dress Code. P&O do ask that children don’t wear denim on Black Tie nights. When dining in the informal or buffet restaurants children can be casually dressed. If children are going to be in the evening in the formal restaurants and theatre then they can still dress more casually adopting our Evening Casual Dress Code. 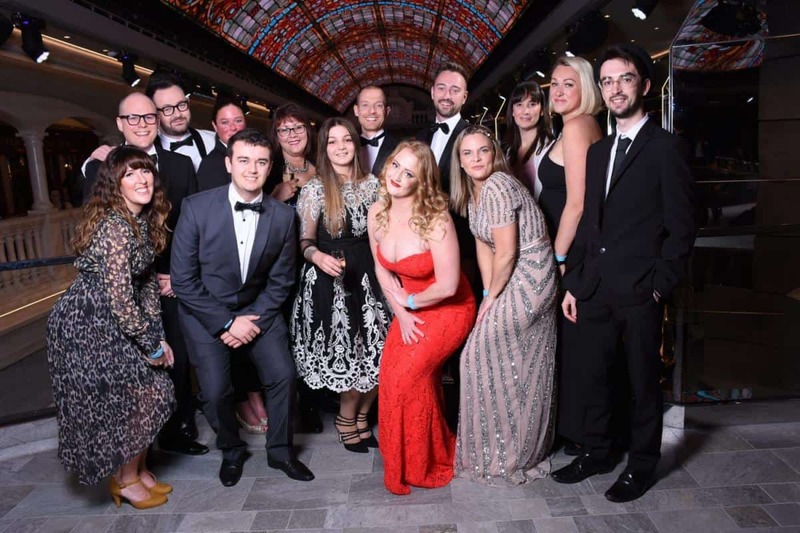 There is no formal night on NCL, Norwegian’s Night Out is the line’s freestyle version of a formal night, which is optional, however some cruises do choose to take part and dress up a little. You may also want to pack an all-white outfit to take part in NCLs White Hot party. Disney has formal, semiformal, “dress-up” and casual nights, “dress-up” nights can be expected on 3 and 4 night cruises, and formal and semiformal on longer cruises. Formal night, tuxedos or suits for men and gowns or dresses for women. Semiformal, suits or jackets for men and dresses or pantsuits for women. “Dress-up” means dress shirts for men (jackets optional) and dresses or pantsuits for women. Most cruises also include one or more theme nights, such as pirate or tropical. It’s not as confusing as it seems, you need to check your restaurants for the dress code as Disney Dining works on a rotation system, Check here for guidance. There is one formal night on a 7 day cruse called the Captains Gala Dinner where men are expected to wear a dinner jacket, tuxedo or a suit and tie. Women can choose a cocktail or evening dress. Children smart dresses shorts and shirts with smart shoes, pumps ( Not trainers) or sandals. There are 2 elegant nights on 7 night cruises and 1 on shorter cruises. Elegant night codes suggests smart trousers and shirt for men with sports jackets, cocktail dresses or pantsuits for women, although you may choose to dress for formally men in a tuxedo and women in evening gowns. Children evening dress code on Carnival can be quite relaxed, with smart shorts and polo shirts, of dressed up should you choose to, however smart pumps (Not trainers) or sandals are required. For those not wanting to dress up for formal evening, the Lido restaurants have a casual dress code. There is 1 formal night on 4-6-night cruises, 2 on 7-9 night cruises, 3 on 10- to 14-night cruises and 4 on cruises of 15 nights or longer. Men are expected to wear suits or jackets and ties, and women cocktail dresses. Cunard embrace formal evenings wholeheartedly and holds 4 and an 8 night transatlantic cruise, two fo these are generally themed. On our cruise my favourite was the Black and White evening. Ladies can really go to town with gowns on Cunard for me this was a real highlight of our cruise. And men must wear a tux or dark suit and tie. The dress code filters across to children too although on non formal night the boys were ok in trousers and smart shirts. On non formal evening men are still expected to wear a jacket, however a tie is optional. If you love dressing up Cunard is a wonderful option. Should you want to miss the formal evenings of have a night off you can dine in the buffet restaurants. 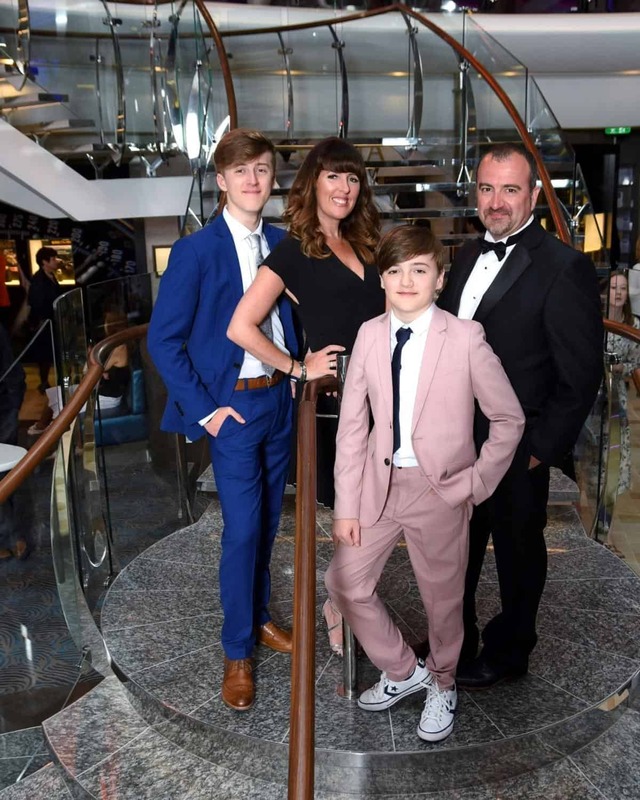 So there you have it, a bumper guide on what to wear on cruise formal night for families, we hope it is useful and if we have missed anything out, please let us know!